Hello everyone and welcome back to another school year! 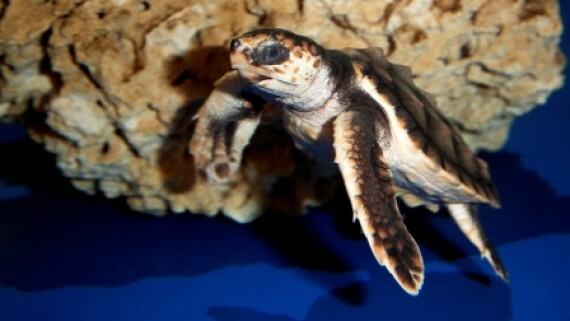 We are busy here at the Aquarium with our yearling sea turtles. They are getting bigger and we are preparing for their release later this fall. We are also caring for two new hatchlings. If you are following along with our older turtles, look here for updated measurements. If you would like to adopt one of our new hatchlings, you can find their measurements at the bottom of this post. This month we are starting off the school year with some inspiration from a local teacher. 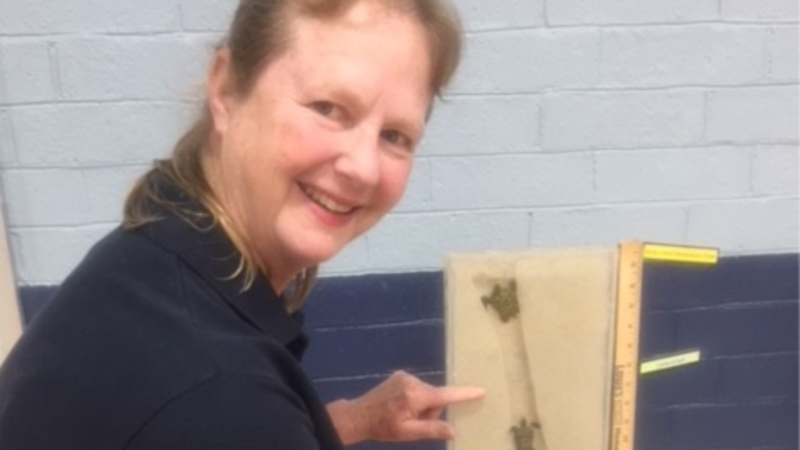 Donna Michaux participated in the Sea Turtle Exploration workshop last year and has been passionate about bringing the curriculum to her students. What Subject/Grade level do you teach? I teach PE at Southport Elementary School, grades K-5. I have been teaching at Southport for 18 years. I like to be inspirational and motivational to the students and see them mature and develop via sports. Most everything we teach can be used in the “game of life” from being a humble winner to building confidence and utilizing good judgement skills. My favorite part about teaching is being able to teach students about the environment and bring science to the gym. When did you become interested in sea turtles? When I was 5 years old, my mother said I would look at the Life magazine over and over on the Galapagos Islands. When I was 18 and at Queens University, Charlotte, NC working on a BS in Biology/Chemistry minor, I worked with a travel agent and set up a school program to go to the Galapagos. It was the greatest trip and experience. 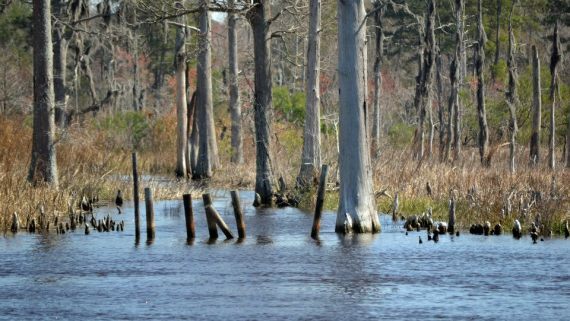 When I moved to Oak Island in 1983, I became the “Turtle Lady” and worked to protect hatchlings during a boil before they even had a program set up by the Oak Island Recreation Department. I have walked the beaches daily since then, noting where sea turtles lay their eggs and educating tourists during nights of turtle nest watching. I also give Turtle Talks to local groups and conduct summer programs with the Maritime Museum for children. 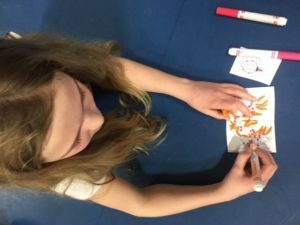 How did you use the sea turtle curriculum in your class? I used the curriculum during our Club Day at school. 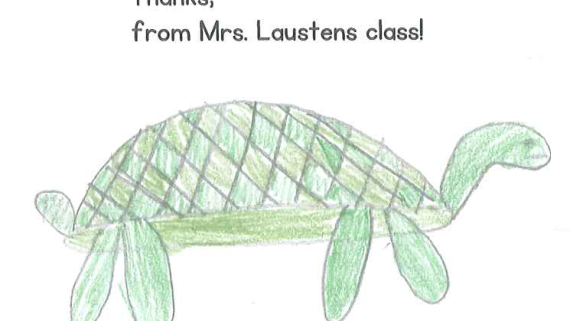 The students know I am the “Turtle Lady” and love anything to do with sea turtles. I guess I have instilled that love in them because people protect what they love, so if they love sea turtles, they will grow up protecting them! I also launched my war on plastic which I called “Power Walking Against Plastic” where I made the students aware of the global issues of plastic. I encouraged them to start using reusable water bottles and taking in reusable grocery bags instead of using single-use plastic bags. I also urged the students to skip the straw. 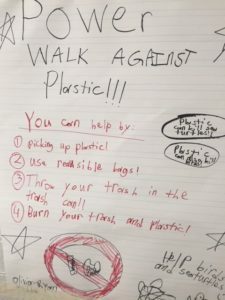 I had the students make environmental posters which we placed around the school to keep them aware of the plastic problem. I also had a program set up where if they picked up trash and plastic outside around the playground and brought it to me, I would give them a “foot” token for helping lower the carbon footprint on Planet Earth and being a Power Walking Environmentalist. They loved it and are totally engaged and empowered! What was the student feedback on the sea turtle curriculum? The students love anything to do with sea turtles. They enjoyed being creative and making the posters as well as coloring the sargassum and sea turtles. I have seen the students showing off their posters that they made to other students. The support and trash pick-up has been so huge that other teachers were complaining that the students wanted to do that more than their studies! They also carried that information home to their parents to make them more aware. 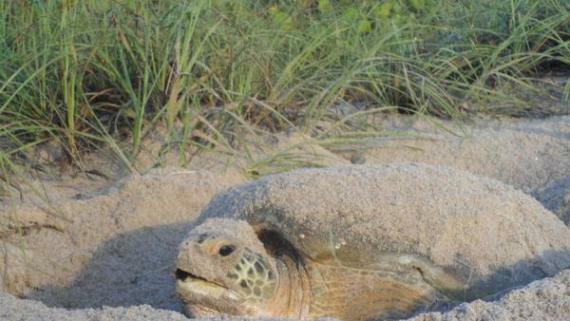 How will you incorporate the sea turtle curriculum into your classes in the future? 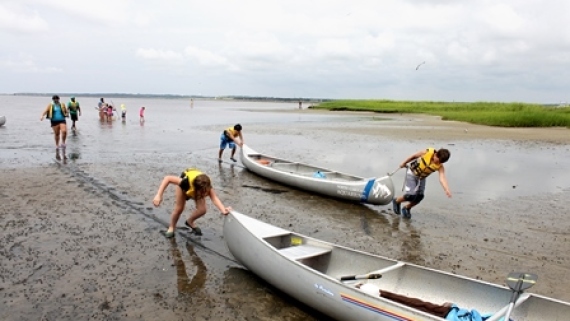 I will continue to use the various lessons and videos developed by the NC Aquarium at Fort Fisher. 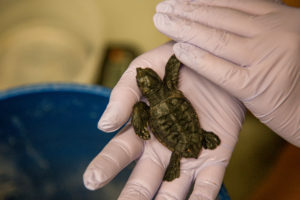 It is super information and very relevant and interesting and the students will enjoy many more sea turtle sessions! See the table below to keep track of our new hatchlings.